Update (8/27/2012): The former Emilia Romagna/Bar ER space will become Taverna 19, a Mediterranean restaurant, bar, and night club. 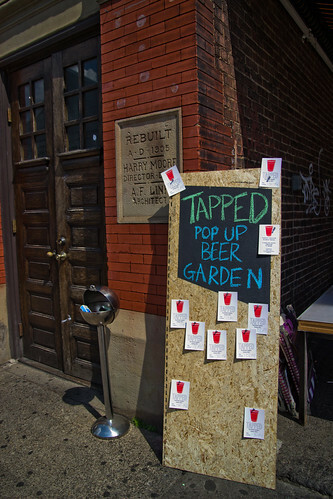 Update (8/23/2012): It was announced on Facebook that the bar is also closed (no word yet on the lounge). However, it appears the same owners are planning something new for the space. Stay tuned. 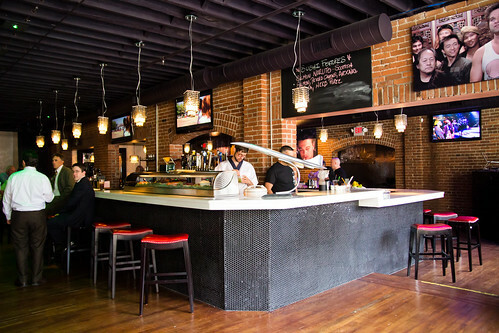 Update (8/21/2012): Emilia Romagna announces on Facebook that the dining room is now closed, but cocktails and lounge are still happening. 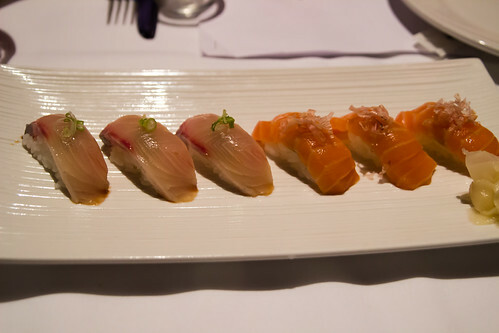 Would you believe me if I told you that some of the best sushi in Pittsburgh can be found at an Italian restaurant? Don't believe me? 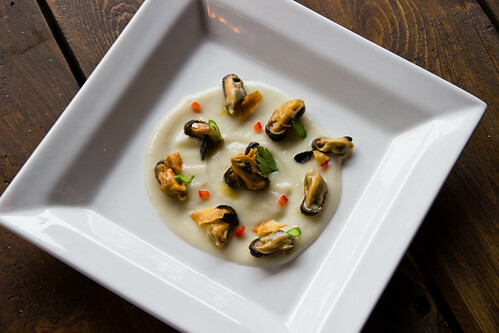 Head to the new Emilia Romagna in the Strip District. 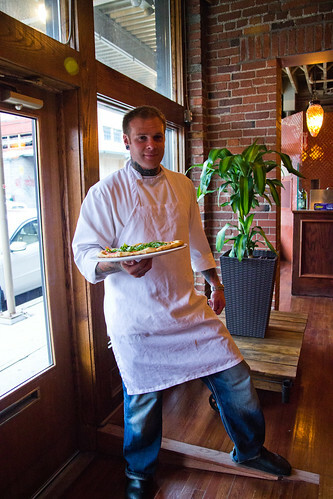 Emilia Romagna is the latest venture of Jonathan and Brandy Vlasic, who also own Alla Famiglia and Arlecchino Ristorante in town. I have not been to either of their other restaurants, but expect Emilia Romagna to be different from your typical Italian restaurant. Vastly different. I guess I already tipped you off with the little tidbit about the sushi. Here's the scoop: Emilia Romagna occupies a sizable space on 19th Street, between Smallman St and Penn Ave. 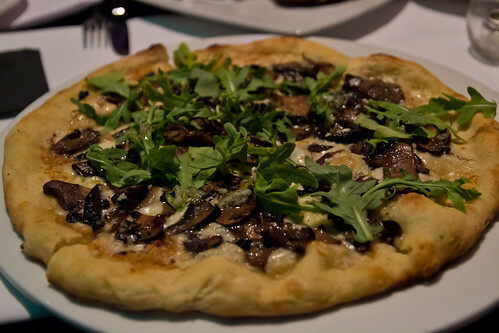 The north side houses the cozy dining room, and that is where you'll find the more traditional Italian menu. 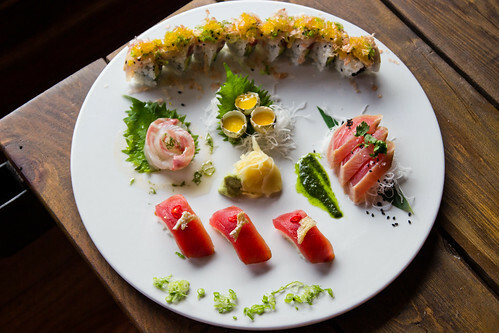 The south side is a tremendous cocktail bar along with a sushi bar headed by Chef Matthew Kemp, formerly of Tamari. Upstairs is a nightclub (V Ultra Lounge), and there is a gorgeous patio out back that extends all the way to 18th Street, complete with a water fountain and beach cabanas. A very unique setup, to be sure. 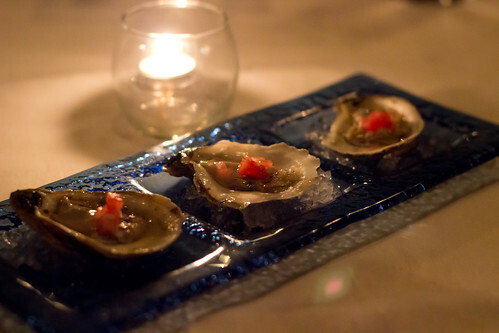 I had the pleasure of dining at Emilia Romagna on an invitation a few weeks ago, during their soft opening. 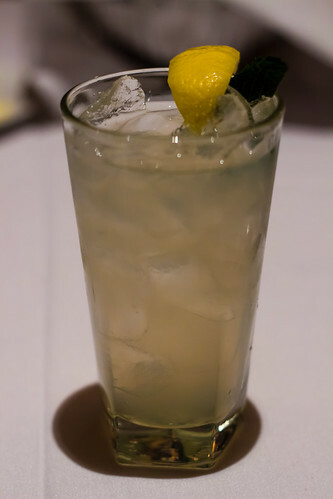 I was back again last week when the same dining buddies suggested a return trip because we were so impressed with the cocktails and food there. 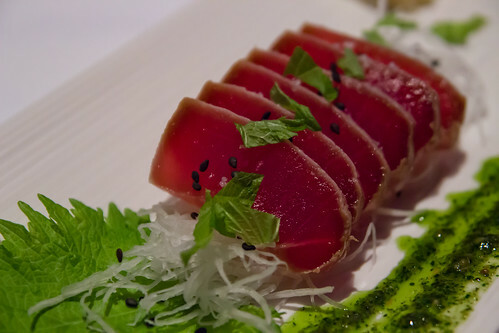 On our first visit, Chefs Cory Hughes and Matthew Kemp offered us a tasting menu consisting of both Italian fare and a sushi sampler. Among the dishes we had were mussels with haricot vert and sunchoke puree; scallops with a Mediterranean citrus salad and local corn zabaglione; oysters with watermelon, basil mignonette, and hot sauce; lamb chop atop cavatelli, with English pea and mint puree, and lamb neck patted down and served with natural jus; and wood-fired prosciutto and arugula pizza with a perfectly soft, thin dough. 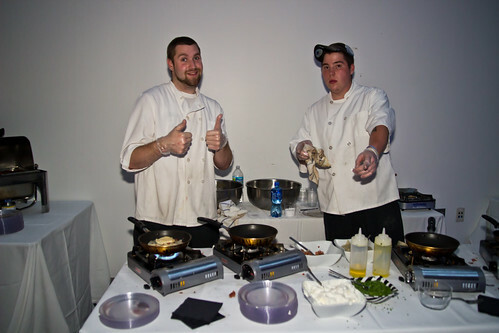 Just as they sound, every dish was an interesting and mouthwatering combination of flavors. We also split two delicious desserts: A traditionally Italian blackberry crostata and a fluffy cheesecake served with peach sauce. Our second visit leaned more sushi-heavy. 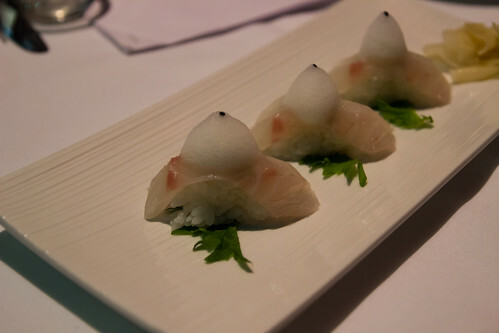 We asked Chef Matt to give us a tasting of his choice, and these were not the standard (read: boring) sushi you get anywhere else. 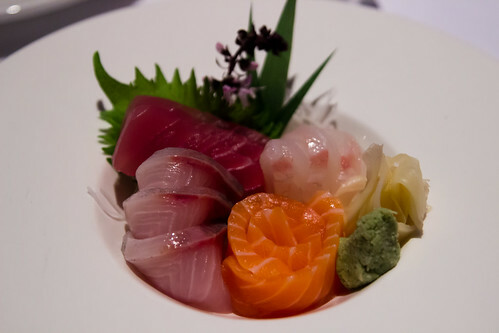 Each fish was garnished with a spice or sauce that provided a distinct contrast and brought out the flavor of the fish in a whole new way. 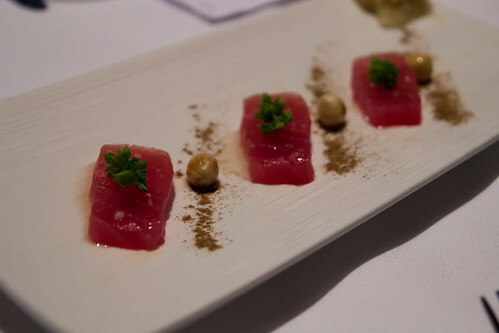 The Zuke or marinated lean tuna, for example, was topped with salmon scale and Thai chili; the Maguro or big eye tuna was served in two different ways - once marinated and served with herbs from their own patio, and once with hazelnut, porchini mushroom powder, hazelnut oil, and fleur de sel; the Salmon sushi was topped with shaved bonito (a type of tuna). I'm not usually a big fan of rolls, because they tend to be rather bland, but I was pleasantly surprised by the unique ER Kitchen Roll, made with tuna, avocado, kampachi, spicy emulsion, Japanese green onion, dried smoked tuna, flying fish roe, and sesame. The evening's special was Aji (a Japanese horse mackerel), a very strong-flavored fish, but nicely balanced by the lemony yuzukoshō. The cocktail menu at Emilia Romagna is extensive, and we enjoyed a fair amount of libation on both visits. The Bellini (seasonal fruit and prosecco), Dirty Blond (vodka, jalapeno and pineapple olive brine, granny smith apple and blue cheese stuffed olives), Ruby T (vodka, campari, grapefruit juice, grapefruit peel/tarragon/prosecco simple syrup), Banana & Basil (bananas liqueur, fresh basil, honey, water), Gin Gin Mule (bluecoat American gin, fresh lime juice, agave nectar, ginger beer, mint smash), and Cucumber Mint (bluecoat American gin, midori, mint cucumber juice, salt, cucumber wheel) were all very potent and very amazing. 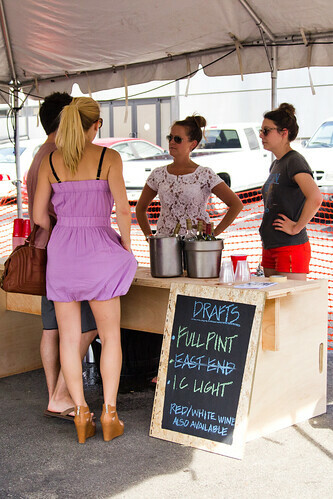 This is a great spot for after-work happy hour. Needless to say, I snapped my share of photos, some of which I showcase here. The entire set can be found here. The lighting (and hence, quality) varies because I lost the benefit of natural lighting sometime mid-meal, and the dining room was quite dimly-lit. Regardless, I hope I was able to do the food some justice. During our visits, we had the opportunity to speak with the owner, the manager, the chefs, and the cocktail mixologist. Every single one of them showed a tremendous amount of enthusiasm for their new venture, and hearing them speak so excitedly and passionately about their food and drinks makes you want to embrace the restaurant even more - as though the terrific food didn't already speak for itself! Emilia Romagna is still fairly new, having just officially opened, and the ristorante-cocktails-sushi-lounge-cabana-bar concept is extremely ambitious. As such, there are still a few kinks to be worked out, especially in terms of speed of service. But do give Emilia Romagna a chance, and your belly will thank you. As a matter of full disclosure, our first meal was complimentary, but we returned as paying patrons for our second meal. As per my policy, there was no promise of a positive review. 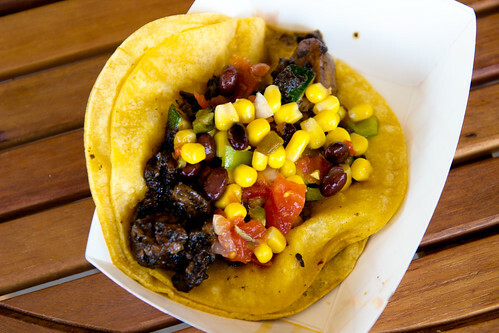 Update (2/9/2013): Pgh Taco Truck is open as of January 18! Track its whereabouts via Twitter or Facebook. 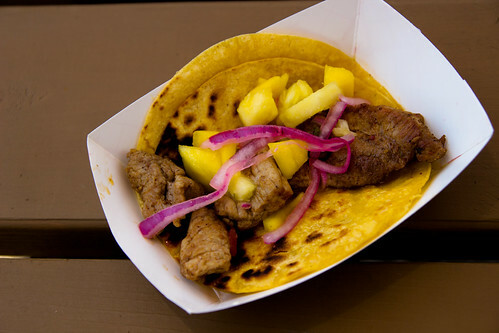 Update (8/22/2012): Due to unforeseen issues, the opening of the Pgh Taco Truck has been delayed. Connect with the truck on Twitter and Facebook to find out when it officially opens. I have mentioned in the past that I didn't used to get very excited about tacos. I guess if the "best" tacos you've ever had came from Chipotle, there really isn't much to get excited over. 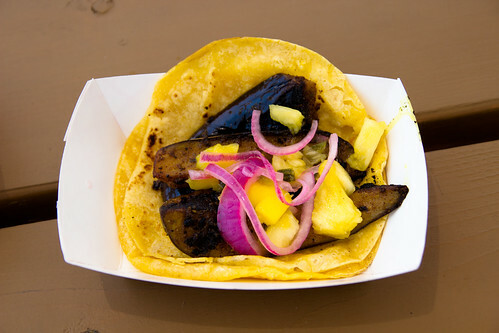 But thanks to friends Señorita Cibulka and Burgh Gourmand's influence, I have gained a whole new appreciation for tacos. 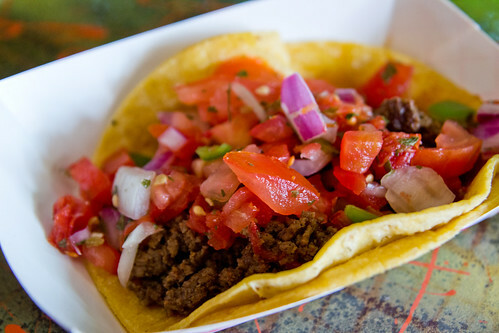 In particular, the recent openings of great taco joints like Smoke and Casa Rasta had me fully converted to taco fandom. 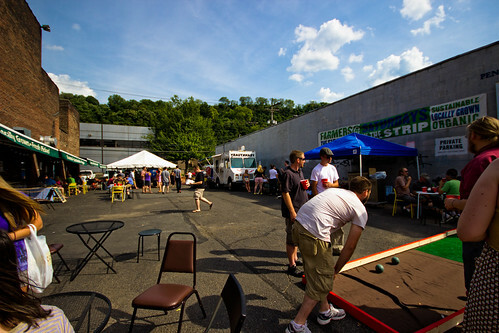 The latest, newest taco venture is the Pgh Taco Truck, due to roll into town on August 15. It is owned and operated by none other than my taco-loving friend, Burgh Gourmand, or James as he is known in real life. Although the actual truck is still in the process of having its kitchen installed, James has been seen slinging tacos at various events around town. 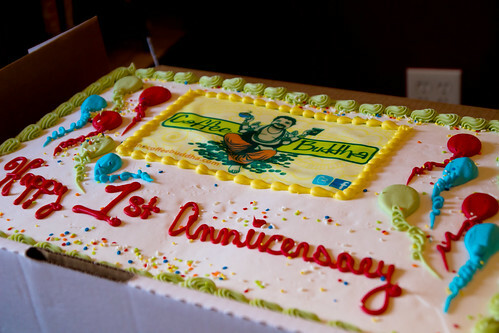 The first of such events I attended was at Coffee Buddha's first anniversary party earlier this month. There are plans for Pgh Taco Truck to vend tacos at Coffee Buddha on a regular basis once the truck officially opens, and there are few things in this world that excite me more than seeing two of my favorite Pittsburgh things partner up this way! Because James is my friend, I realize that my opinion may be biased. However, I have personally experienced James' exemplar cooking well before the idea of Pgh Taco Truck even entered his consciousness, at a time when my raving about his food in a public forum served no commercial purpose. On the other hand, being James' friend gives me an insider's knowledge about his approach and enthusiasm for his new venture. He talks of his college gig selling burritos on the streets, and having taken on various jobs in the years since, some food-related and some not, but his heart was always in street food vending. Since the day he decided to embark on this new adventure, he has spent countless hours and energy sourcing ingredients, testing taco flavors, designing the kitchen, researching ways to make his operation more "green," and lobbying to improve laws governing food trucking. I have personally witnessed how much James has poured his heart and soul into making the best-tasting tacos you can find, and I am really looking forward to the official opening! 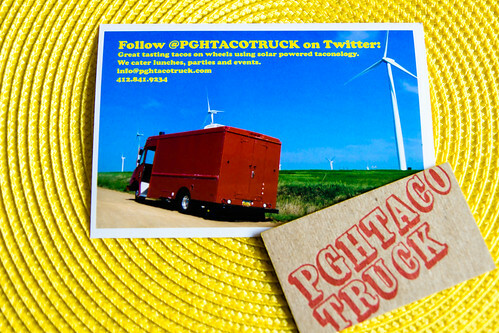 Follow Pgh Taco Truck on Twitter or Facebook to see where you can find the truck on any given day. 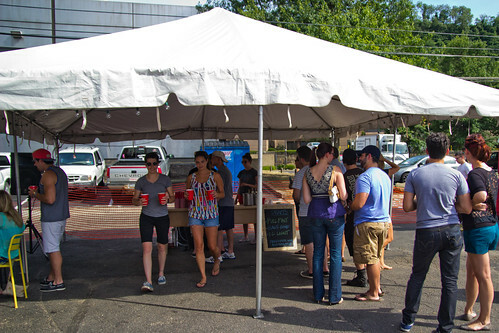 The Pgh Taco Truck is also available for private catering. Happy Birthday, Coffee Buddha! May there be many more! 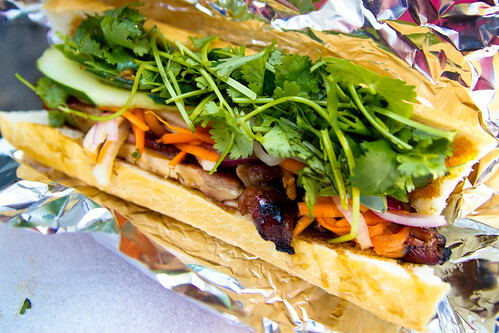 What is the one thing I really, really, really miss about Washington, DC (aside from my friends)? Teaism. 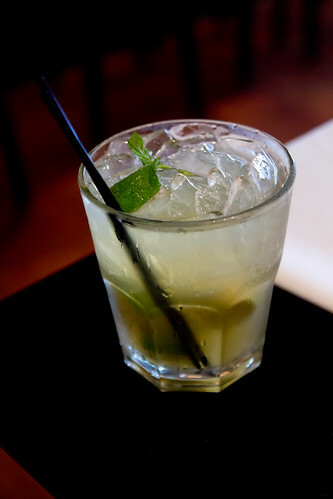 In particular, the ginger limeade at Teaism, an amazingly refreshing drink on those hot DC summer days. Mix all ingredients together. 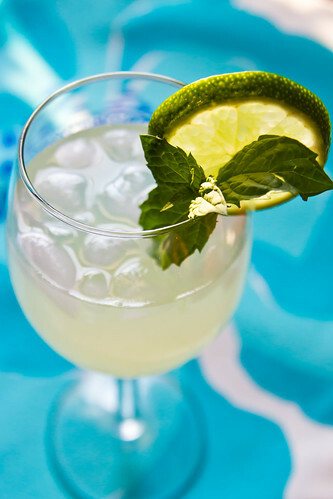 Serve over crushed ice and garnish with mint leaves and lime slice if desired. In my last post I declared my love for ginger, and mentioned that I have been using it a lot lately. 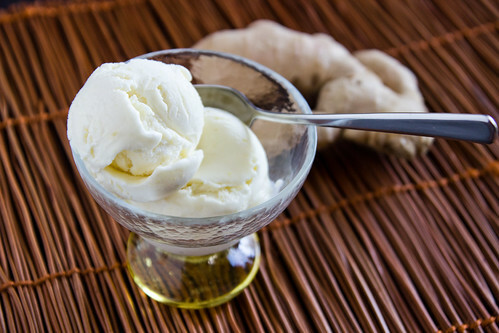 One of the things I had always wanted to try was to make ginger ice cream since I've never found a ginger ice cream at a restaurant or an ice cream shop that I've liked. Often, this is because candied ginger is used, and I'd really prefer the fresh stuff, while other times I just can't barely taste the ginger. You know how they say your tastebuds change every seven years? Well, I don't know about that, but I'm sure everyone has had the experience of liking certain foods they didn't used to before. Ginger is one of those foods for me. 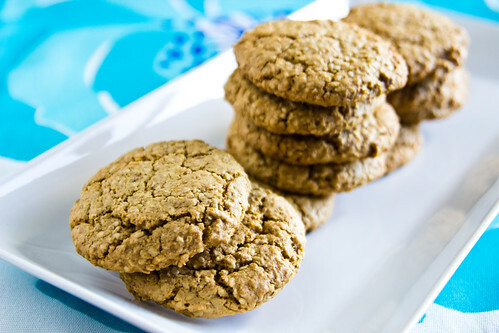 As a child, I hated ginger, though that's not saying much since I have yet to meet a child who likes it. But now that I'm older (and wiser? ), I have grown to love this Asian spice. 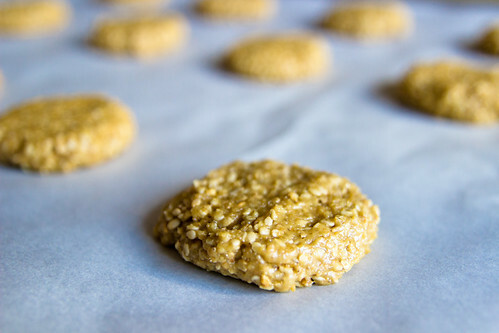 Lately, I've been particularly inspired to experiment with it in the kitchen, so here's the first of a series of ginger recipes I've been working with in recent weeks. R. and I were visiting his mom for the fourth of July and we had some of her homemade ginger pasta salad - no exaggerations here, but it was the first pasta salad I've ever liked. It was so good that after we got home, I wanted to try making it myself. While I could have just asked mom-in-law for her recipe, I wanted to see if I could recreate her dish on my own, and this is what I came up with. Cook rotini according to package directions. Drain. In a large bowl, mix the first seven ingredients together (from celery to red pepper). 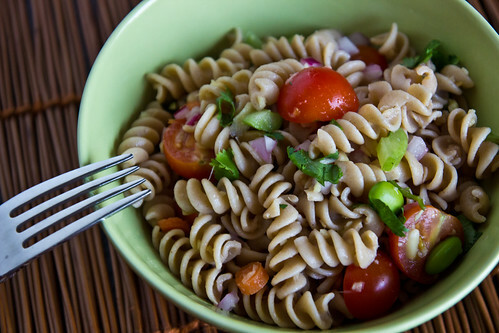 In another large bowl, toss together the cooked rotini, grated ginger, and red wine vinegar. Pour the pasta into the mixed veggies. Toss well. Top with toasted pine nuts. *Disclaimer: I am a ginger fiend and like to be able to taste it in my dish, so I am rather generous when it comes to the amount of ginger to use. It may or may not work for everybody. 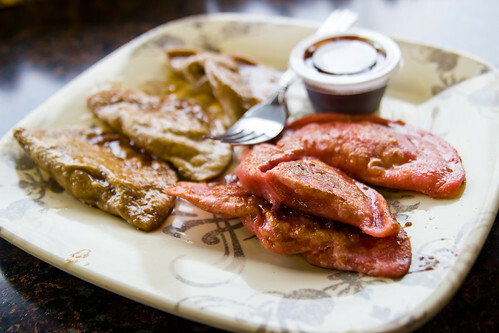 The first time I heard of Szmidt's Old World Deli, I was at a work party and someone had brought along some of Szmidt's pierogies - two sweet varieties and a savory kind. It made such a positive impression on me that when R. was looking for a place to take an out-of-town friend, I suggested Szmidt's, even though I hadn't been there myself. They came back raving about it, which made me proud. I am always glad when I can help show off to outsiders the best that Pittsburgh has to offer. I finally made my way to the little shop myself earlier this month. I ordered a McCarthy Sandwich, loaded with slow roasted beef, onions, lettuce, tomato, mushrooms, peppers, provolone cheese, and horseradish mayo. The meat was juicy and perfectly done and the veggies were fresh, and the soft homemade bun was icing on the cake. I came here with pretty high expectations and I was not disappointed. Of course, I had to have some pierogies, especially the sweet pierogies, because I like how they gave this classic a twist and, well, I have a sweet tooth. (*blush*) I ordered three Apple Mango and three Strawberry with Chocolate Sauce (a seasonal special). 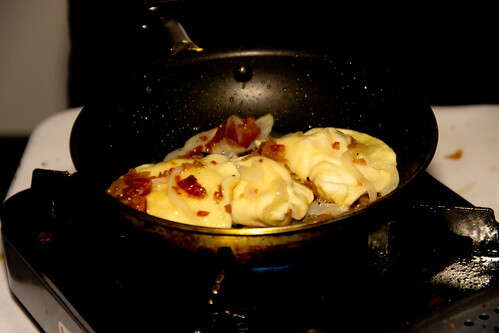 The homemade pierogie dough was fried just right and the fillings were simple yet worked nicely. What a great deli! 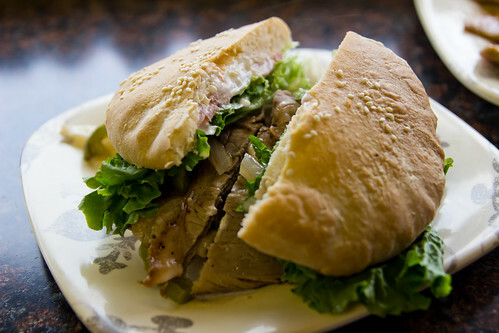 Can't wait to try some of the other sandwiches and pierogies at Szmidt's. In my last post I mentioned growing more herbs this year, which necessitates more creativity on my part to cook with herbs ready for harvest. My thyme has been growing like mad, so I made this rice dish, modified from a recipe I had found online sometime ago. I'm surprised how great it turned out, and a friend tried the recipe with basil instead of thyme and LOVED it. :) I think the key is to use good-quality cheese, and the lemon gives it a nice tang. This is definitely going into my regular rotation. Cook rice, thyme leaves, lemon juice, and lemon zest together in rice cooker (or follow package directions if a rice cooker is not available). Heat oil in a skillet over medium heat. 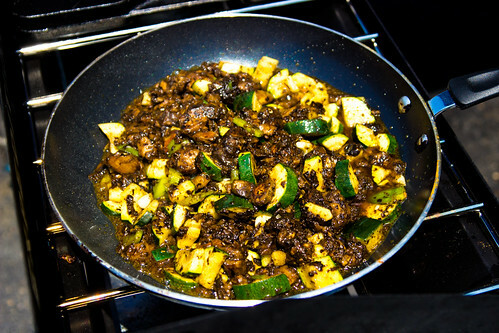 Cook the zucchini, green onions, and garlic about 5 minutes, until zucchini is tender. Season with salt, pepper, garlic salt, paprika, and oregano. 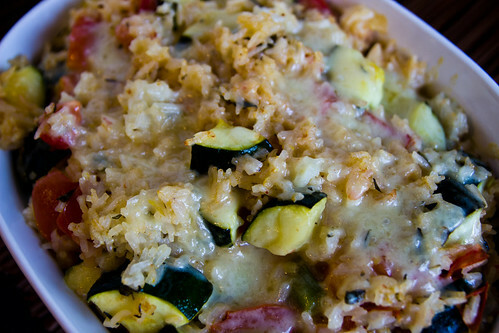 Mix in cooked rice, tomatoes, and cheese, preserving some of cheese for the topping. Spray a 2.5 quart casserole dish with cooking spray. 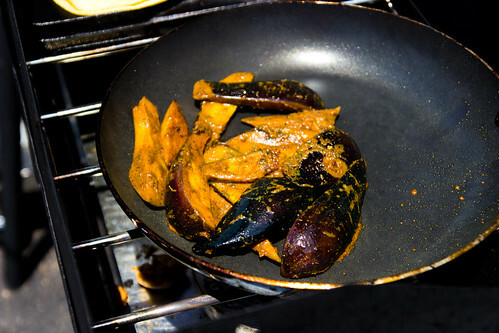 Transfer content from the skillet to the casserole dish. Top with remaining cheese. Last summer, I started growing herbs at home - parsley, basil, and mint - and really enjoyed having fresh herbs at my disposal all season long. This year, I decided to expand my collection to include cilantro, thyme, and rosemary. That's all well and fine, except every week I have to figure out some way to use a large amount of herbs ready to be harvested! My first "project" was to use up some rosemary. 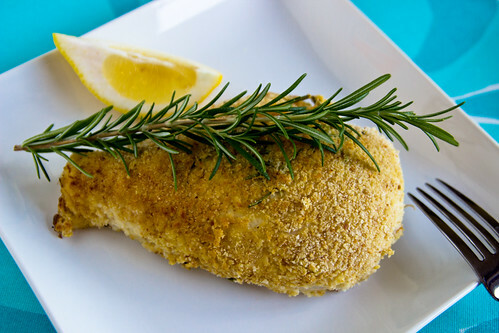 I thought it might go well with lemon and some breaded chicken, so I modified an old breaded chicken recipe to create this. Juice half the lemon. Save the other half for garnish. In a small bowl, beat together egg, Dijon mustard, lemon juice, and rosemary leaves. Place flour in a flat-bottomed bowl. Place bread crumbs in another flat-bottomed bowl. Season chicken with salt and pepper. Roll chicken in flour, then dip in the egg mixture, then roll in bread crumbs. Spray an oven-proof skillet with cooking spray and heat on medium-high heat. Cook chicken for 5 minutes, turning once, until the breading is slightly browned. Bake chicken for 20-25 minutes, until done. Serve with lemon for a splash of juice. A few weeks ago, we were invited to sample the new Summer "Plates" lunch menu at The Capital Grille in downtown Pittsburgh. The Capital Grille has been on my radar since the time I lived in the Washington DC area where my condo was literally one block from one of its locations, but alas, I never had the chance to dine there, so this was an opportunity I didn't want to miss. 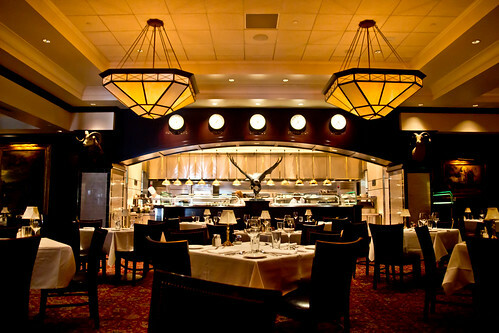 Inside, The Capital Grille is elegant and posh, but comfortable. It is very spacious, yet feels intimate. 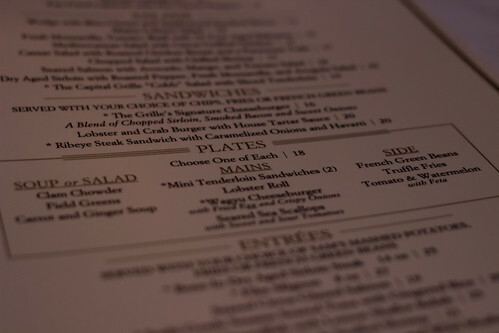 The center of the menu is where the "Plates" selection can be found, and it features a soup or salad, and entree, and a side for $18. 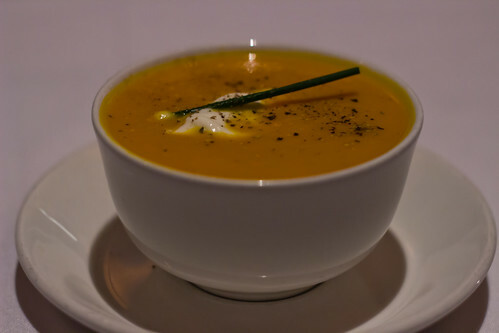 Both R. and I chose the Carrot and Ginger Soup as our appetizer. This soup had just the right amount of sweetness and the ginger added a nice kick. For my entree, I chose the Seared Sea Scallops, a new item on the menu. It is paired with sweet and sour tomatoes and served with an Israeli couscous. This chef really hit the nail on the head with this concoction. 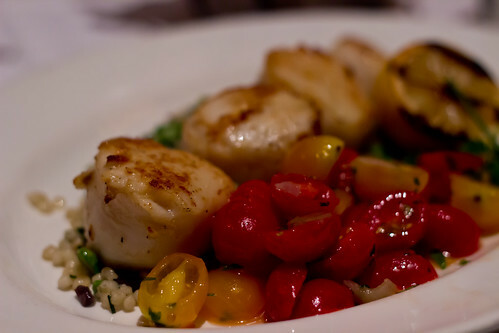 The scallops were cooked to perfection, and there was just a hint of the juices from the tomatoes that gave it a more complex flavor. 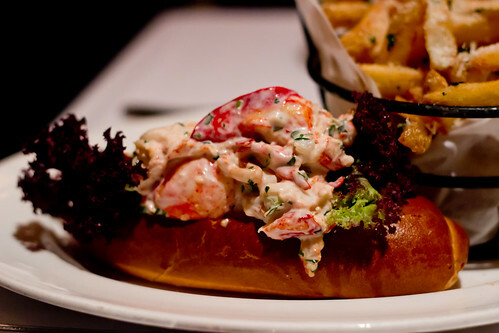 R. got the Lobster Roll, which consisted of large chunks of lobster and lettuce in a bun. The dressing is slightly sweet and worked exceptionally well with the lobster. 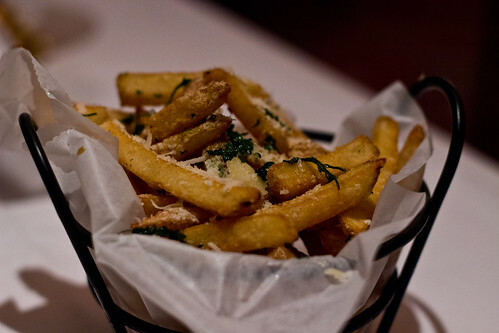 For our sides, we both ordered the Truffle Fries, which were absolutely delicious. Amsterdam really raised my standards for fries, and these truffle fries rose to the challenge. 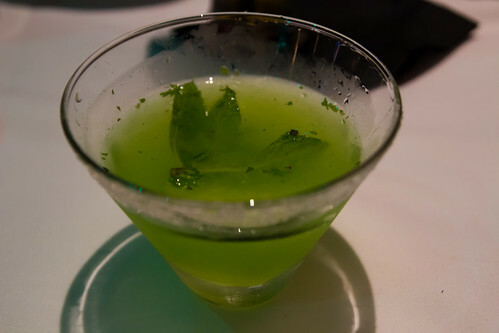 I didn't order a beverage, but R. had gotten a Mint Lemonade that was tasty and refreshing. The Capital Grille caters to the business lunch crowd, and can get you through your meal in 45 minutes without feeling rushed. The service is attentive and professional, and it's clear they go out of their way to add that personal touch. If I worked downtown, I would bring my clients here to impress them...but I don't work downtown. 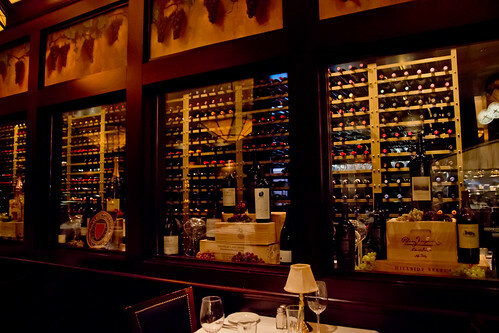 While I won't be business lunching here much myself, I'm definitely adding The Capital Grille to my list of great downtown restaurants for the times I do find myself in the neighborhood. As a matter of full disclosure, our meal was complimentary, but as per my rule, there was no promise of a positive review in exchange.